On Tuesday, February 25, 2003 at his home in Oxon Hill, Maryland. Danny was born in Sanford, West Virginia, on February 4, 1931. He was one of three boys born to John and Annie Sorrels. His brothers, John and Russell Sorrels, his parents and one daughter, Danice Sorrels Wilcher preceded him in death. 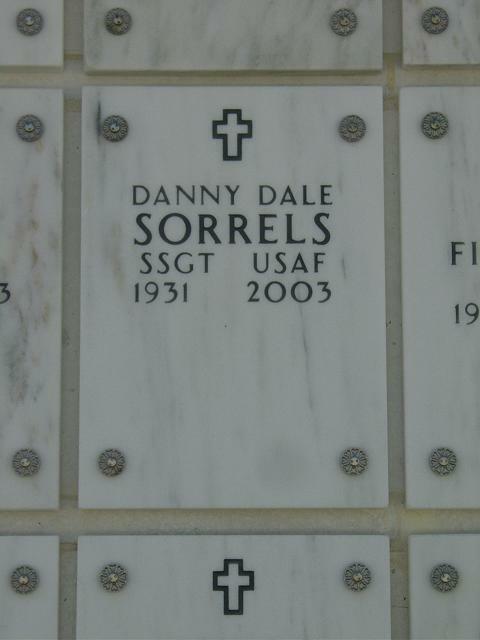 He was married to Delores Sorrels for 25 years and she was the mother of his four children, Sabrina, Danice, Sergeant Major Danny II (USMC) and Selina. He is also survived by 10 grandchildren. He served in the U.S. Air Force from 1948 to 1952 as a Flight Engineer with honorable discharge as a Staff Sergeant. He brought his young bride to the Washington, D.C. area in 1955 and went to work for Capitol Airlines as an A/E mechanic. He was then hired by the U.S. Government Civil Service and there served as a flight engineer on C-119s. He raised his family in Forestville, Maryland, where they lived for 13 years then moved to Oxon Hill, Maryland, when he retired from civil service. He was a business owner of a small interior design business called Dan-Dee Interiors DBA Oxon Hill Interiors. Danny's favorite activity when he retired was working in his yard and he was often seen giving his neighbors a helping hand. Danny truly had a gift of making the homliest flower or bush grow beautiful. In Forestville, he coached Little Leage Basebal where his son played on All American teams. Danny's ability to make everyone laugh charmed everyone that came into contact with him. Danny had a second gift, a way with kids. He could bring himself down to their level, relating to them like a kid himself. Those whose lives he touched will not soon forget the playful boy within him. Danny's remains will be cremated as he requested. In lieu of flowers or cards, the family asks that a donation be given to the program, Boys and Girls Club of America, that promotes after-school programs that keep kids off the streets. Danny had left these words for all of you who knew him, "I have been loved and hated; good and bad things have been said about me. I wouldn't want that image changed. I've enjoyed all of it." Military services will be held March 13, 2003, at 11 a.m. at Arlington National Cemetery.